Go Inside The Hunt For The Boston Bombers In All-New Special – Nat Geo TV Blogs. Nat Geo has put together a superb two hour special that’s riveting on the Boston Bombers. Today is the one year anniversary of the Boston Marathon bombing. The 2014 Boston Marathon will be run on Monday, April 21. The Nat Geo special was on Sunday night and replayed immediately after and will be replayed on Wednesday, April 16 at 9pm ET/8pm CT. You don’t want to miss this 2-hour special which focuses primarily on the impeccable work done by the FBI, the Mass. State Police, the City of Boston police and the people of Boston who pulled together to overcome this tragedy. Then be sure to go to http://www.bostonglobe.com and check out the interactive photo with survivors, emergency workers, runners, spectators, law enforcement personnel and all those who were touched by the bombing one year ago today. I guarantee it will bring the bombing into focus for you. Below is the url of the Nat Geo page for the special which airs again on Wednesday. You won’t want to miss it, so set your DVR. Please say a prayer today for the three people who lost their lives and observe a moment of silence at 2:42pm ET for the survivors. The Walking Dead Zombie Bowl | Which Walker Scares You Most?. Watch Sunday’s Walking Dead marathon and you can vote in the “Which Zombie Scares You the Most” Tournament? The Well Walker is one my personal favorites, followed by the two Michonne had as pets. Next Sunday, The Walking Dead is back with new episodes. It’s about time, though I have been enjoying the array of games and articles at the AMC website. They have this great game where they want you to guess which zombie goes with which season. I did pretty good when I was concentrating and not trying to show off to Eddie, my UPC man. I think I got 100% in Season 1 and then I got cocky. You can find that feature under Games, Polls and Quizzes at the AMC site. If you’re not already getting the Walking Dead newsletter, you should sign up for that and possibly win some swag. If you don’t feel like watching zombies on Sunday, there’s always Kittens, Puppies and of course, football. You choose. Having a hard time waiting till February 9 when The Walking Dead returns? I definitely sympathize. I was overjoyed that the marathon was on so I could record the Season 3 episodes and watch those at my leisure (and delete the commercials). I myself was busy writing, working on my own “assignment” as it were, so having The Walking Dead as a back drop served as inspiration. No, I’m not writing a zombie novel. I’m just saying I write better with something good playing on TV. 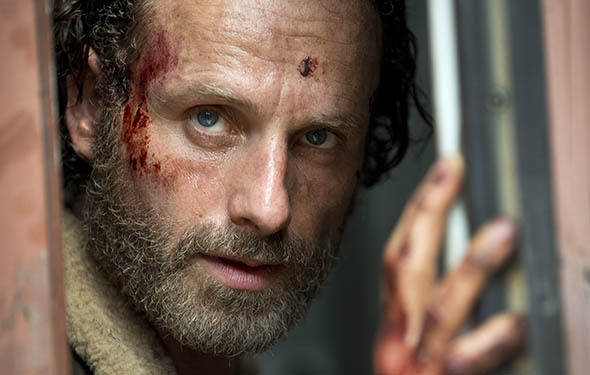 If you need something to tied you over until February 9, you should check out The Walking Dead‘s fan site at http://www.amctv.com. 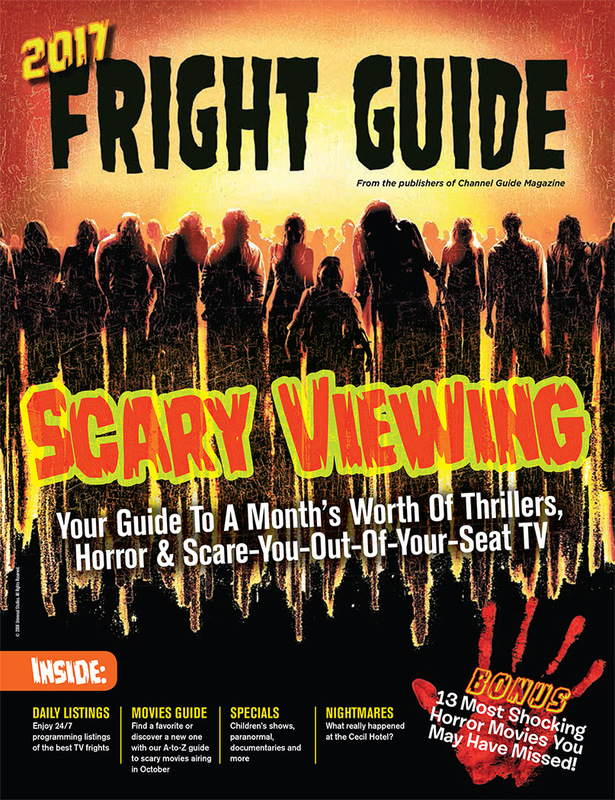 There’s plenty there that will satisfy your zombie craving including full episodes from Season 1 in black and white, blogs, photos, some really cool games, apps, and, now that Christmas is over, shopping. Amazon has some great deals on Seasons 1, 2 and 3 in DVD and Blu ray formats. There are also some Limited Editions that are reduced in price, including this Season 3 LE Blu ray which Amazon is listing for $79.99 (down from $149.99). The Season 2 LE Blu ray remains at a very high price, $389.99 and features a head with a screwdriver in his eye. When you lift the head, the Blu ray boxes are inside a cavity of the head. There are other prices for this one, slightly used, slightly discounted, still pricey. 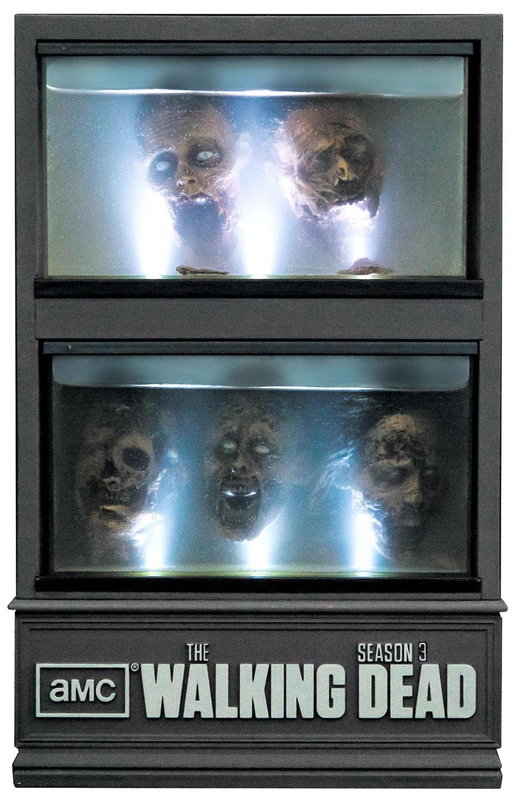 You should go to Amazon and check out all their Walking Dead merchandise, 27+ pages of it. They also have a poster book which I’m seriously contemplating about purchasing. It contains 40 posters at a cost of about 50 cents per ($21.24 + shipping unless you’re a Prime Member, then shipping is free). What didn’t materialize last year, will be featured this year, on AMC starting at 8am on Tuesday, Dec. 31 (New Year’s Eve). 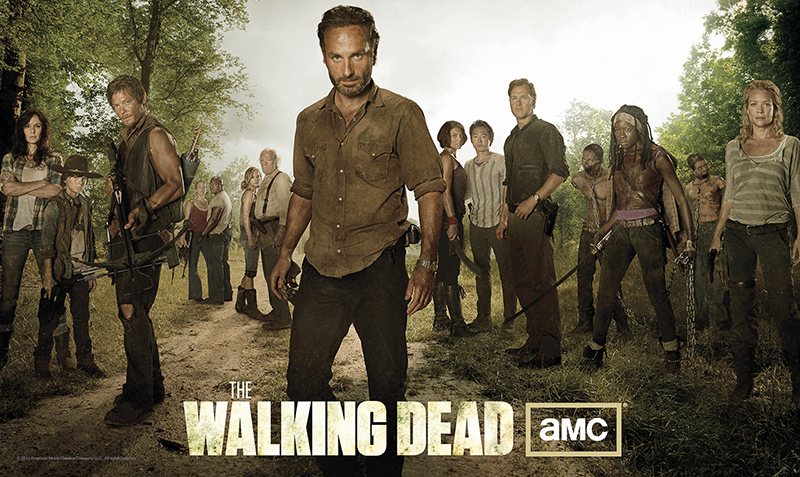 Days Gone Bye, the first episode of Season 1 will start the marathon (8am-9:30am). Season 1, which only had six episodes in it when it premiered, will conclude at 1:30pm, Dec. 31 with TS-19. One of my favorite episodes out of four seasons plays at 11:30am, Vatos, can’t be missed. 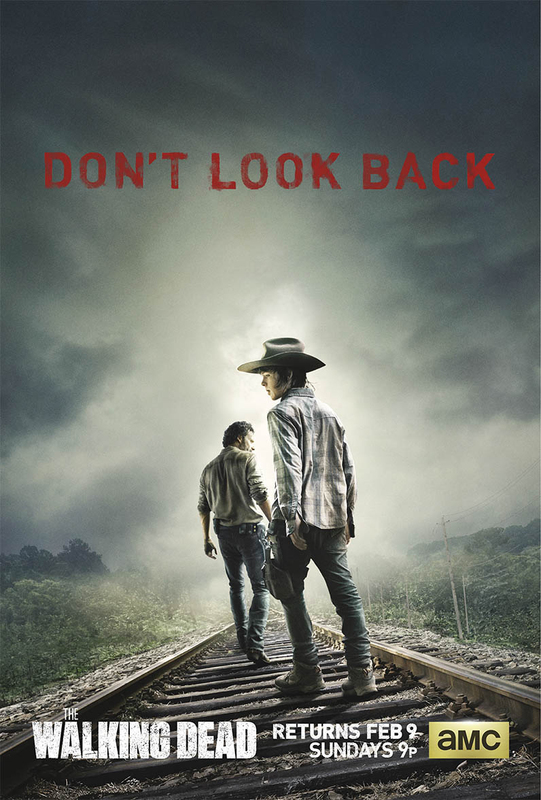 It shows what The Walking Dead is all about – relationships, the human experience and where you were when the world went to hell, what you did afterward, and how you decided to carry on to survive and help those around you. There’s a great line in there about buying some dogs from Satan at his yard sale. Season 2 picks up at 2:30pm with What Lies Ahead and continues through 3am on January 1, 2014 (Happy New Year!) with Beside the Dying Fire. 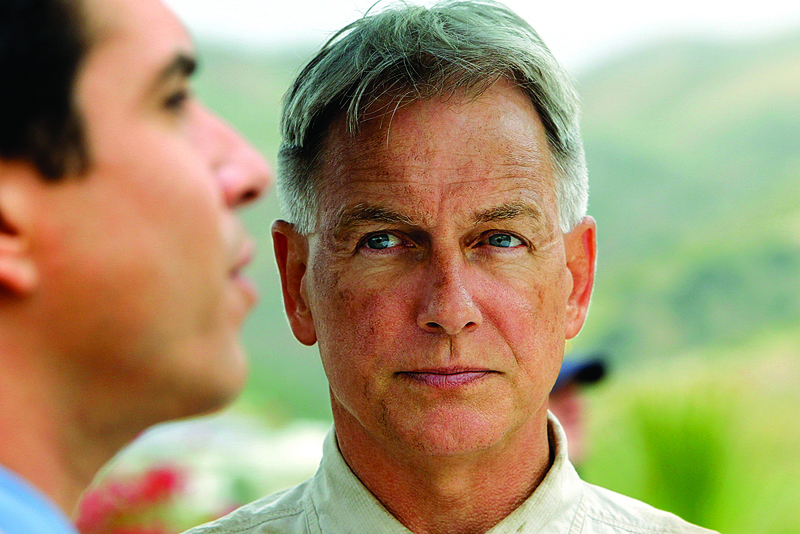 Season 3 starts off right away at 4am January 1 with Seed and continues till 7pm with Welcome to the Tombs. Season 4 begins at 8pm with 30 Days Without an Accident and continues till 3am with Too Far Gone, the mid-season finale. Season 4 continues Sunday February 9. So get busy and clean off your DVR. Here’s your chance to get every episode and watch it from beginning to end. Share it with your friends (and family). Let it be the background of your New Year’s Eve party. I’m not even going to suggest that you get out your zombie recipes. I did that last year and the marathon never happened so let’s just say I’m sending you the vibe to do so, if you feel like it. I watched Season 1 & 2 while on a train to New Orleans a couple of weeks ago so I probably won’t jump in until Season 3 begins.